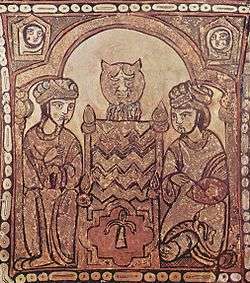 Arabic painting made for the Norman kings (c. 1150) in the Palazzo dei Normanni, originally the emir's palace at Palermo. The history of Islam in southern Italy began with the first Muslim settlement in Sicily, at Mazara, which was captured in 827. 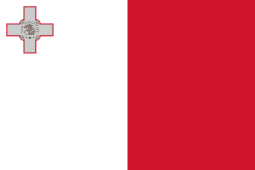 The subsequent rule of Sicily and Malta started in the 10th century. Islamic rule over all Sicily began in 902, and the Emirate of Sicily lasted from 965 until 1061. Though Sicily was the primary Muslim stronghold in Italy, some temporary footholds, the most substantial of which was the port city of Bari (occupied from 847 until 871), were established on the mainland peninsula, with Muslim raids reaching as far north as Rome and Piedmont. The Muslim raids were part of a larger struggle for power in Italy and Europe, with Christian Byzantine, Frankish, Norman and local Italian forces also competing for control. Muslims were sometimes sought as allies by various Christian factions against other factions. The first permanent Arab settlement on Sicily occurred in 827, but it was not until Taormina fell in 902 that the entire island fell under their sway, though Rometta held out until 965. In that year the Kalbids established the independence of their emirate from the Fatimid caliphate. In 1061 the first Norman conquerors took Messina, and by 1071 Palermo and its citadel (1072) were captured. In 1091 Noto fell to the Normans, and the conquest was complete. Malta fell later that year, though the Arab administration was kept in place, marking the final chapter of this period. The conquests of the Normans established Roman Catholicism firmly in the region, where Eastern Christianity had been prominent during the time of Byzantine rule and even remained significant during Islamic period. Widespread conversion ensued, leading to the disappearance of Islam in Sicily by the 1280s. In 1245, Muslim Sicilians were deported to the settlement of Lucera, by order of Holy Roman Emperor Frederick II. In 1300, Giovanni Pipino di Barletta, count of Altamura, seized Lucera and exiled or sold into slavery its population, bringing an end to the medieval Muslim presence in Italy. The first attacks by Islamic ships on Sicily, then part of the Byzantine Empire, occurred in 652 under the Rashidun Caliphate of Uthman. These were Arab mujahideen directed by the Governor of Syria, Muawiyah I, and led by Mu'awiya ibn Hudayj of the Kindah tribe, and they remained on the island for several years. Olympius, the Byzantine exarch of Ravenna, came to Sicily to oust the invaders but failed. Soon after, the Arabs returned to Syria after collecting a sufficiently large amount of booty. A second Arab expedition to Sicily occurred in 669. This time, a strong, ravaging force consisting of 200 ships from Alexandria attacked the island. They sacked Syracuse, Sicily and returned to Egypt after a month of pillaging. After the Muslim conquest of the Maghreb (completed around 700), attacks from Muslim fleets repeated in 703, 728, 729, 730, 731, 733, and 734. The last two Arab assaults were met with substantial Byzantine resistance. The first true conquest expedition was launched in 740. In that year, Habib ibn Abi Obeida al-Fihri, who had participated in the 728 attack, successfully captured Syracuse. Though ready to conquer the whole island, the expedition was forced to return to Tunisia by a Berber revolt. A second attack in 752 aimed only to sack Syracuse again. In 805, the imperial patrician of Sicily, Constantine, signed a ten-year truce with Ibrahim I ibn al-Aghlab, Emir of Ifriqiya, but this did not prevent Muslim fleets from other areas of Africa and Spain from attacking Sardinia and Corsica from 806–821. In 812, Ibrahim's son, Abdallah I, sent an invasion force to conquer Sicily. His ships were first harassed by the intervention of Gaeta and Amalfi and were later destroyed in great number by a tempest. However, they managed to conquer the island of Lampedusa and to ravage Ponza and Ischia in the Tyrrhenian Sea. A further agreement between the new patrician Gregorius and the emir established the freedom of commerce between southern Italy and Ifriqiya. After a further attack in 819 by Mohammed ibn-Adballad, cousin of Amir Ziyadat Allah I of Ifriqiya, no subsequent Muslim attacks on Sicily are mentioned by sources until 827. The Muslim conquest of Sicily and parts of southern Italy lasted 75 years. According to some sources, the conquest was spurred by Euphemius, a Byzantine commander who feared punishment by Emperor Michael II for a sexual indiscretion. After a short-lived conquest of Syracuse, he was proclaimed emperor but was compelled by loyal forces to flee to the court of Ziyadat Allah in Africa. The latter agreed to conquer Sicily, with the promise to leave it to Euphemius in exchange for a yearly tribute. He entrusted its conquest to the 70-year-old qadi, Asad ibn al-Furat. The Muslim force numbered 10,000 infantry, 700 cavalry, and 100 ships, reinforced by the fleet of Euphemius and, after the landing at Mazara del Vallo, by knights. The first battle against Byzantine troops occurred on July 15, 827, near Mazara, resulting in an Aghlabid victory. Asad subsequently conquered the southern shore of the island and laid siege to Syracuse. After a year of siege and an attempted mutiny, his troops were able to defeat a large army sent from Palermo backed by a Venetian fleet led by doge Giustiniano Participazio. However, the Muslims retreated to the castle of Mineo when a plague killed many of their troops and Asad himself. They later returned to the offensive but failed to conquer Castrogiovanni (the modern Enna, where Euphemius died), retreating back to Mazara. In 830, they received a strong reinforcement of 30,000 African and Spanish troops. The Spanish Muslims defeated the Byzantine commander Theodotus in July and August of that year, but a plague once again forced them to return to Mazara and then to Africa. The African Berber units sent to besiege Palermo captured it in September 831 after a year-long siege. Palermo, renamed al-Madinah, became the Muslim capital of Sicily. In February 832, Ziyadat Allah sent his cousin Abu Fihr Muhammad ibn Abd-Allah to the island and appointed him as the wāli of Sicily. He defeated the Byzantines in early 834, and in the following year his troops reached as far as Taormina. The war dragged on for several years with minor Ahglabid victories, while the Byzantines resisted in their strongholds of Castrogiovanni and Cefalù. New troops arrived in the island from the new Emir Al-Aghlab Abu Affan and occupied Platani, Caltabellotta, Corleone, Marineo, and Geraci, granting the Muslims total control of western Sicily. In 836, Muslim ships helped their ally, Andrew II of Naples, when he was besieged by Beneventan troops, and with Neapolitan support Messina was also conquered in 842. In 845, Modica also fell, and the Byzantines suffered a crushing defeat near Butera, losing about 10,000 men. Lentini was conquered in 846, and Ragusa followed in 848. In 851, the governor and general Al-Aghlab Abu Ibrahim died. He was succeeded by Abbas ibn Fadhl. He started a campaign of ravages against the lands still in Byzantine hands, capturing Butera, Gagliano, Cefalù, and, most important of all, Castrogiovanni, in winter 859. Many of the captives from Castrogiovanni were sent to the Caliph Al-Mutawakkil, as a representation of Abbas ibn Fadhl's victory. In response, the Byzantine emperor sent a large force in 859–860 under Constantine Kontomytes, but the army and the fleet carrying it were defeated by Abbas. Byzantine reinforcements led many of the cities subjugated by the Muslims to revolt, and Abbas devoted the years 860–861 to reduce them. Abbas died in 861, replaced by his uncle Ahmed ibn Yaqub and, from February 862, by Abdallah, son of Abbas; the latter was in turn replaced by the Aghlabids with Khafagia ibn Sofian, who captured Noto, Scicli, and Troina. In the summer of 868, the Byzantines were defeated for the first time near Syracuse. Hostilities resumed in the early summer of 877 by the new sultan, Jafar ibn Muhammad al-Tamini, who besieged Syracuse; the city fell on May 21, 878. 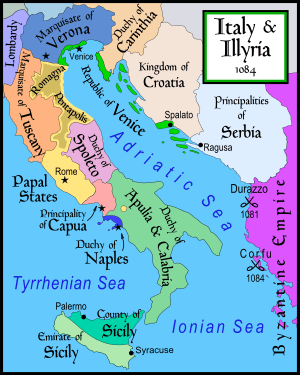 The Byzantines now maintained control over a short stretch of coast around Taormina, while the Muslim fleet attacked Greece and Malta. The latter fleet was, however, destroyed in a naval battle in 880. For a while, it seemed that the Byzantines could regain Sicily, but new land victories for the Muslims re-established their control. 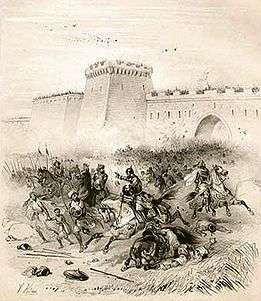 A revolt in Palermo against Governor Seuàda ibn Muhammad was crushed in 887. The death of the strong Emperor Basil I in 886 also encouraged the Muslims to attack Calabria, where the imperial army was defeated in the summer of 888. However, the first inner revolt was followed by another in 890, mostly spurred by the hostility between Arabs and Berbers. In 892 an emir was sent from Ifriqiya by Ibrahim II ibn Ahmad to Palermo but was ousted again a few months later. The prince did not relent and sent another powerful army to Sicily under his son, Abu l-Abbas Abdallah, in 900. 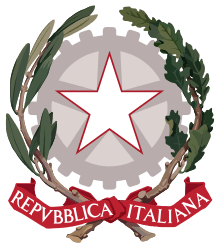 The Sicilians were defeated at Trapani (August 22) and outside Palermo (September 8), the latter city resisting for another ten days. Abu l-Abbas moved against the remaining Byzantine strongholds and was also able to capture Reggio Calabria on the mainland on June 10, 901. As Ibrahim was forced to abdicate in Tunis, he decided to lead in person the operations in southern Italy. Taormina, the last main Byzantine stronghold in Sicily, fell on August 1, 902. Messina and other cities opened their gates to avoid a similar massacre. Ibrahim's army also marched on southern Calabria, besieging Cosenza. Ibrahim died of dysentery on October 24. His grandson stopped the military campaign and returned to Sicily. At this point (902), Sicily was almost entirely under the control of the Aghlabids with the exception of some minor strongholds in the rugged interior. The population had been somewhat increased by Muslim migrants from Iberia, North Africa, and the Middle East. The emir in Palermo nominated the governors of the main cities (qadi) and those of the less important ones (hakim), along with the other functionaries. Each city had a council called a gema, composed of the most eminent members of the local society, which was entrusted with the care of the public works and of the social order. The conquered Sicilian population lived as dhimmi or converted to Islam. The Arabs initiated land reforms that increased productivity and encouraged the growth of smallholdings, a mere dent in the dominance of the landed estates. The Arabs further improved irrigation systems. With about 300,000 inhabitants, Palermo in the 10th century was the most populous city in Italy. A description of the city was given by Ibn Hawqal, a Baghdad merchant who visited Sicily in 950. A walled suburb called the Kasr (the citadel) was (and remains) the center of Palermo, and the great Friday mosque stood on the site of the later Roman cathedral. The suburb of Al-Khalisa (Kalsa) contained the sultan's palace, baths, a mosque, government offices, and a private prison. Ibn Hawqal reckoned there were 7,000 individual butchers trading in 150 shops. In 909, the African Aghlabid dynasty was replaced by the Fatimid Caliphate, an Ismaili Shi'i dynasty. Four years later, the Fatimid governor was ousted from Palermo when the island declared its independence under Emir Ahmed ibn-Kohrob. His first deed was a failed siege of Taormina, which had been rebuilt by the Christians; he was more successful in 914 when a Sicilian fleet under his son Mohammed destroyed the Fatimid navy sent to recover the island. The following year, the destruction of another fleet sent against Calabria and the unrest caused by ibn Kohrob's reforms led to a revolt of the Berbers. The Berbers captured and hanged ibn Kohrob, allegedly in the name of the Fatimid Caliph Abdullah al-Mahdi Billah, hoping he would leave them freedom of rule in Sicily. Al-Madhi instead sent an army which sacked Palermo in 917. The island was governed by a Fatimid emir for the following 20 years. In 937, the Berbers of Agrigento revolted again but after two resounding successes were decisively beaten at the gates of Palermo. An army was then sent by the new Fatimid caliph, Al-Qa'im bi-Amr Allah, to besiege Agrigento twice until it fell on November 20, 940. The revolt was totally suppressed in 941 with many of the prisoners sold as slaves and Governor Khalil boasting to have killed 600,000 people in his campaigns. Southern Italy circa 1000, showing the Kalbid emirate before its collapse. After suppressing another revolt in 948, the Fatimid Caliph Ismail al-Mansur named Hassan al-Kalbi as emir of the island. As his charge soon became hereditary, his emirate became de facto independent from the African government. In 950, Hassan waged war against the Byzantines in southern Italy, reaching up to Gerace and Cassano allo Ionio. A second Calabrian campaign in 952 resulted in the defeat of the Byzantine army; Gerace was again besieged, but in the end Emperor Constantine VII was forced to accept having the Calabrian cities pay a tribute to Sicily. In 956, the Byzantines reconquered Reggio and invaded Sicily; a truce was signed in 960. Two years later a revolt in Taormina was bloodily suppressed, but the resistance of the Christians in Rometta led the new Emperor Nikephoros II Phokas to send an army of 40,000 Armenians, Thracians, and Slavs under his nephew Manuel, who captured Messina in October 964. On 25 October, the Byzantines were defeated in a fierce battle with the Kalbids. Manuel, along with 10,000 of his men, was killed in the fray. The new Emir Abu al-Qasim (964–982) launched a series of attacks against Calabria in the 970s, while the fleet under his brother attacked the Adriatic coasts of Apulia, capturing some strongholds. As the Byzantines were busy against the Fatimids in Syria and with the partial conquest of the Bulgarian Empire, the German Emperor Otto II decided to intervene. The allied German-Lombard army was defeated in 982 at the Battle of Stilo. However, as al-Qasim himself had been killed, his son Jabir al-Kalbi prudently retreated to Sicily without exploiting the victory. The emirate reached its cultural peak under the emirs Jafar (983–985) and Yusuf al-Kalbi (990–998), both patrons of the arts. The latter's son Ja'far was instead a cruel and violent lord who expelled the Berbers from the island after an unsuccessful revolt against him. In 1019, another uprising in Palermo was successful, and Ja'far was exiled to Africa and replaced by his brother al-Akhal (1019–1037). Southern Italy in 1084, showing the remains of the Kalbid emirate, then fought over by multiple claimants, on the eve of the final Norman conquest. With the support of the Fatimids, al-Akhal defeated two Byzantine expeditions in 1026 and 1031. His attempt to raise a heavy tax to pay his mercenaries caused a civil war. Al-Akhal asked the Byzantines for support while his brother abu-Hafs, leader of the rebels, received troops from the Zirid Emir of Ifriqiya, al-Muizz ibn Badis, which were commanded by his son Abdallah. The Norman Robert Guiscard, son of Tancred, invaded Sicily in 1060. The island was split between three Arab emirs, and the Sicilian population rose up against the ruling Muslims. One year later, Messina fell, and in 1072, Palermo was taken by the Normans. The loss of the cities, each with a splendid harbor, dealt a severe blow to Muslim power on the island. Eventually all of Sicily was taken. In 1091, Noto in the southern tip of Sicily and the island of Malta, the last Arab stongholds, fell to the Christians. By the 11th century, Muslim power in the Mediterranean had begun to wane. Many repressive measures were introduced by Frederick II to please the popes who were afraid of Islam close to the papal state. This resulted in a rebellion by Sicilian Muslims, which in turn triggered organized resistance and systematic reprisals and marked the final chapter of Islam in Sicily. The Muslim problem characterized Hohenstaufen rule in Sicily under Henry VI and his son Frederick II. The annihilation of Islam in Sicily was completed by the late 1240s when the final deportations to Lucera took place. Some of the expelled Muslims were deported to Lucera (Lugêrah, as it was known in Arabic). Their numbers eventually reached between 15,000 and 20,000, leading Lucera to be called Lucaera Saracenorum because it represented the last stronghold of Islamic presence in Italy. The colony thrived for 75 years until it was sacked in 1300 by Christian forces under the command of the Angevin Charles II of Naples. The city's Muslim inhabitants were exiled or sold into slavery, with many finding asylum in Albania across the Adriatic Sea. After the expulsions of Muslims in Lucera, Charles II replaced Lucera's Saracens with Christians, chiefly Burgundias and Provençal soldiers and farmers, following an initial settlement of 140 Provençal families in 1273. A remnant of the descendants of these Provençal colonists, still speaking a Franco-Provençal dialect, has survived till the present day in the villages of Faeto and Celle di San Vito. The joint capture of Bari by Byzantine and Franco-Lombard troops led by the Emperor Louis II in 871. The Adriatic port city of Bari, in the Apulia region of southern Italy, was captured by a Muslim army in 847, then remained under Muslim control for the next 25 years. It became the capital of a small independent Islamic state with an emir and a mosque of its own. The first ruler of Bari was Khalfun, a Berber leader who had probably come from Sicily. After his death in 852, he was succeeded by Mufarraq ibn Sallam, who strengthened the Muslim conquest and enlarged its boundaries. He also asked for official recognition from Baghdad Caliph al-Mutawakkil's governor in Egypt as wāli (i.e., prefect ruling over a province of the Abbasid empire). The third, and last, emir of Bari was Sawdan, who came to power around 857 after the murder of Mufarraq. He invaded the lands of the Lombard Duchy of Benevento, forcing duke Adelchis to pay a tribute. In 864, he obtained the official investiture asked by Mufarrag. The town was embellished with a mosque, palaces and public works. [Pandenolf] began to attack Gaeta's territory, and in retaliation against the pope Docibilis unleashed a group of Arabs from Agropoli near Salerno on the area around Fondi. The pope was "filled with shame" and restored Traetto to Docibilis. Their agreement seems to have sparked off a Saracen attack on Gaeta itself, in which many Gaetans were killed or captured. Eventually peace was restored and the Saracens made a permanent settlement on the mouth of the Garigliano river. The Saracen camp at Minturno (in modern-day Lazio) by the Garigliano River became a perennial thorn in the side for the Papacy and many expeditions sought to get rid of them. 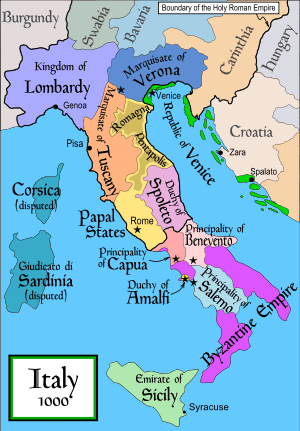 In 915, Pope John X organised a vast alliance of southern powers, including Gaeta and Naples, the Lombard princes and the Byzantines; 'though, the Amalfitans stood aloof. The subsequent Battle of the Garigliano was successful, and the Saracens were ousted from any presence in Lazio or Campania permanently; 'though, raiding would be a continuous problem for another century. In 898 the Abbey of Farfa was sacked by "Saracens", who burned it to the ground. Abbot Peter of Farfa managed to organise the community's escape and salvaged its library and archives. In 905, the monastery was again attacked and destroyed by "Saracens". Other areas of historical Saracen presence in central and southern Italy include, Saracinesco, Ciciliano and Nocera Inferiore. In 1480, an Ottoman Turkish fleet invaded Otranto, landing nearby the city and capturing it along with its fort. Pope Sixtus IV called for a crusade, and a massive force was built up by Ferdinand I of Naples, among them notably troops of Hungarian king Matthias Corvinus, despite frequent Italian quarreling at the time. The Neapolitan force met with the Turks in 1481, thoroughly annihilating them and recapturing Otranto. In 1537, the famous Turkish corsair and Ottoman admiral Barbarossa tried again to conquer Otranto and the Fortress of Castro, but the Turks were eventually repulsed from the city. Ottoman incursions on the south and west coasts of Italy continued into the 17th-century. Pozzuoli and Castellamare in the Bay of Naples were attacked in 1548; Ischia in 1544; Reggio in Calabria in 1594 (cathedral destroyed); and Vieste, Vasto Manfredonia were raided and sacked in 1554, 1560, and 1620 respectively. Arabic art and science continued to be heavily influential in Sicily during the two centuries following the Christian reconquest. Frederick II, Holy Roman Emperor and King of Sicily in the early 13th century, is said to have been able to speak Arabic (as well as Latin, Sicilian, German, French, and Greek) and had several Muslim ministers. The heritage of the Arabic language can still be found in numerous terms adapted from it and still used in the Sicilian language. Another legacy of Muslim rule is the survival of some Sicilian toponyms of Arabic origin, for example "Calata-" or "Calta-" from Arabic qalʿat (قلعة) "castle [of]". ↑ Krueger, Hilmar C.; Musca, Giosue (1966). "Review of L'emirato di Bari, 847-871 by Giosuè Musca". Speculum. Medieval Academy of America. 41 (1): 761. doi:10.2307/2852342. JSTOR 2852342. ↑ Krueger, Hilmar C. (1969). "Conflict in the Mediterranean before the First Crusade: B. The Italian Cities and the Arabs before 1095". In Baldwin, M. W. A History of the Crusades, vol. I: The First Hundred Years. Madison: University of Wisconsin Press. pp. 40–53. ↑ Jellinek, George (1994). History Through the Opera Glass: From the Rise of Caesar to the Fall of Napoleon. Kahn & Averill. ISBN 0-912483-90-3. ↑ Kenneth M. Setton, "The Byzantine Background to the Italian Renaissance" in Proceedings of the American Philosophical Society, 100:1 (Feb. 24, 1956), pp. 1–76. ↑ Daftary, Farhad. The Ismāʻı̄lı̄s: Their History and Doctrines. Cambridge University Press. ISBN 0-521-37019-1. ↑ Julie Taylor, Muslims in Medieval Italy: The Colony at Lucera, (Rowman & Littlefield Inc., 2003), 18. ↑ Caroline Bruzelius, The Stones of Naples: Church Building in the Angevin Kingdom, 1266-1343, (Yale University Press, 2004), 107. ↑ J. B. Bury, History of the Eastern Empire, (Cosimo Classic, 2008), 307. ↑ J. B. Bury, History of the Eastern Empire, 307. ↑ Abulafia, David (1988). Frederick II: A Medieval Emperor. London: Allen Lane. ISBN 0-7139-9004-X. ↑ "The Military Factor in Social Change Vol. 2". google.it. ↑ "Mercenaries in Medieval and Renaissance Europe". google.it. ↑ "Italian City States 1250-1453 by Sanderson Beck". beck.org. ↑ Skinner, see first chapter. See also the vast literature on the coming of the Normans to southern Italy. ↑ Skinner, 33, based on Leo of Ostia and the Chronica Monasterii Cassinensis. ↑ Mary Stroll, The Medieval Abbey of Farfa: Target of Papal and Imperial Ambitions, (Brill, 1997), 32-33. ↑ Between Salt Water and Holy Water: A History of Southern Italy, by Tommaso Astarita. ↑ Georgina Masson (1957). Frederick II of Hohenstaufen. A Life. London: Secker & Warburg. ISBN 0-436-27350-0. Gabrieli, Francesco; Umberto Scerrato (1993). Gli Arabi in Italia. Cultura, contatti e tradizioni. Milan: Garzanti Scheiwiller. ISBN 88-7644-024-0. Metcalfe, Alex (2009). Muslims of Medieval Italy. Edinburgh: Edinburgh University Press. ISBN 0-7486-2007-9. Previte-Orton, C. W. (1971). The Shorter Cambridge Medieval History. Cambridge: Cambridge University Press. ISBN 0-521-05993-3. Skinner, Patricia (1995). Family Power in Southern Italy: The Duchy of Gaeta and its Neighbours, 850–1139. Cambridge: Cambridge University Press.